Panelists and speakers at the South County Economic Development Council’s 28th Annual Economic Summit came together last Friday to discuss the opportunities the South Bay holds to providing affordable housing and sustainable employment options for the future of San Diego County. The summit’s masters of ceremony included Doug Kerner, SCEDC chair, Hon. 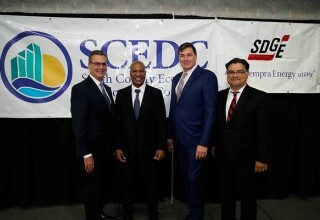 Dukie Valderrama, Commissioner of the Port of San Diego, and Tony McCune, founding member of SCEDC. A sold-out house and the highest attendance in SCEDC Summit’s history, nearly 600 of San Diego’s business leaders and public officials gathered for the South County Economic Development Council’s 28th Annual Economic Summit. 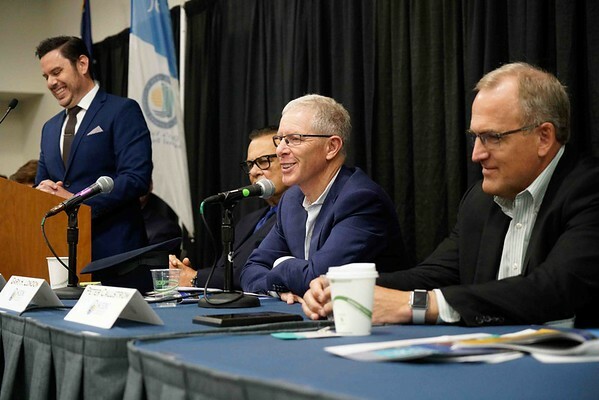 The summit offered attendees a comprehensive look into the San Diego South Bay and Baja region’s latest business development and economic outlook news. Kelly Cunningham, senior economist of San Diego Institute for Economic Research; Ray Major, chief economist at SANDAG; Gary H. London, senior principal at London Moeder Advisors; and San Diego Workforce President Peter Callstrom rounded out the economic panel. During the panel, Cunningham discussed the challenges that San Diego’s economy faces in comparison to the state and the country. 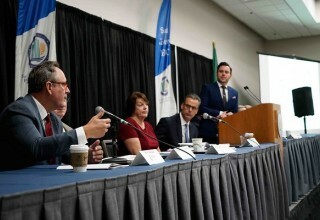 He specifically talked about South County, averring that South County’s Gross Domestic Product (GDP) has grown seven percent from 2015 to 2016, compared to a one percent increase in San Diego County as a whole. He also talked about employment changes in South County, which included an increase in areas such as manufacturing, warehousing/transportation, health care and more. Gary London focused his discussion on the balance between supply and demand in terms of housing and jobs in South County and around San Diego County, mentioning that housing is cheaper in South County by $200,00 than the regional average. The challenge, in London’s words, is to “address the disconnection between where jobs are and where they need to be.” This imbalance is predicted to lead to a 40,000 housing unit shortage by 2020. Major shared his predictions for the coming year, stating that our regional economy is well positioned for the 21st century with a strong base and unique infrastructure that supports the innovation, biotech, military and hospitality industries. However, he also noted that there is a current shortage in housing of more than 50,000 units in San Diego County and the necessity for housing is forecasted to only increase in the coming years. 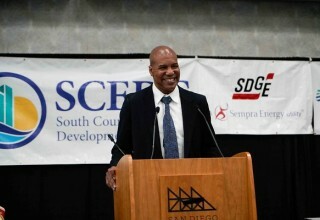 Peter Callstrom, chief executive officer at San Diego Workforce Partnership, talked about the employment opportunities for disconnected youth in South County. Callstrom mentioned there are currently 41,000 disconnected youth in San Diego. He defined disconnected youth as individuals between the ages of 16-24 who are neither working nor in school, but also wants them to be known as opportunity youth. Connect2Careers, a program of the San Diego Workforce Partnership, is a direct response to this ongoing challenge. The program helps secure employment and training for the disconnected youth. They assist in creating resumes, preparing for interviews and educating about the local labor market. The second panel included elected officials from South County and the Baja region. Among those present were Ben Hueso, Senator of the 40th Senate District; Lorena Gonzalez Fletcher, Assemblywoman of the 80th Assembly District; Greg Cox, Supervisor for the County of San Diego; Vice Mayor Albert Mendivil of National City; Pat Aguilar, City Councilmember of Chula Vista; Mark West, City Councilmember of Imperial Beach; Rafael Castellanos, Chairman for the Port of San Diego; Hon. Ernesto Ruffo Appel, Senator of Mexico; Hon. Mirna Rincon Vargas, Mayor of Rosarito; and Ivette Casillas, Councilwoman and the President of the Commission on Tourism, Commerce and Sister-Cities in Tijuana. 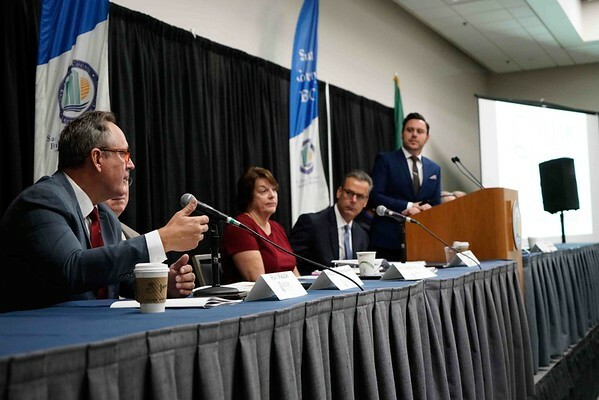 With a diverse panel from both sides of the border, many important topics were covered, continuing with affordable housing as well as talking about the Chula Vista Bayfront and Tijuana sewage, among other topics. Hon. Mirna Rincon Vargas talked about the changes in political arenas in Baja California and how she sees these as opportunities rather than challenges. With recent elections in Mexico, Baja representatives are looking forward to strengthening relationships and continue to work on the amelioration of both sides of the border. The summit ended with keynote speakers Paul Vaden, a native San Diegan and world boxing champion, and Dr. Christopher Thornberg, a founding partner of Beacon Economics. Thornberg addressed the lack of focus on the real issues at hand that our national economy is facing, but nonetheless commended San Diego’s thriving economy in recent years, stating that one-sixth of the jobs in the nation are in California, wages are growing faster than any other state and San Diego has had the highest jump in household income in the nation. Vaden spoke about his journey from a young boxer at the Jackie Robinson YMCA in San Diego to becoming a world champion, linking his success in sports with his perseverance to always be great and the love for the city that made him who he is. Vaden is the only San Diego World Champion in any sport and lives in Chula Vista. Tony is a founding member of the South County Economic Development Council and has served a board member since its inception 29 years ago. He’s had a significant impact in the South County region through his involvement with several non-profits and his car dealerships in National City. For his influence, Higgs Fletcher & Mack presented the Regional Leadership Award to Tony McCune and have renamed it the Tony McCune Regional Leadership Award. Marcela has represented the San Diego and Tijuana area in her role as Consul General. Her service to the bi-national community includes helping develop and support NAFTA to enhance the global economy of San Diego. Patty has consistently led efforts to highlight non-profit excellence in South County. She has also served her community as a council member. Through her work at SBCS, Patty has supported and assisted community members in South Bay. ARYA Cleaners is one of the most environmentally sustainable businesses in South Bay. They have invested thousands of dollars in their infrastructure to be more energy efficient and to reduce and eliminate toxic material from their process. Action Drone has been extremely active in organizing the drone community in San Diego. Since establishing the Drone Consortium based at San Diego Community College, Action Drone has initiated global drone opportunities for unmanned systems in the San Diego area. Dukie has long been an outstanding leader in our region, from his service at the Port of San Diego to his strong support of the South County EDC. Commissioner Valderamma has served on numerous public and private boards, including the San Diego County Water Board, the Southwestern College Foundation Board and the South County EDC. The summit is the largest public forum the South County EDC holds annually. For more information on the summit and upcoming South County events and development, visit www.southcountyedc.com or email scedc@southcountyedc.com.